People with minor sugar problems. People looking to avoid problems in the future. People looking to lose weight. And people looking to slow down the aging process. "I have been on several various medications for diabetes. Still, my blood sugar level was always over 200, and I was going crazy because the doctor said I was facing having to go on insulin. I even saw an endocrinologist, who just put me on a whole bunch of other pills. This was all very discouraging. But then I found [your formula] , and even though I've only been on it for ten days, my blood sugar hasn't risen above 150! I am very happy and excited about [your formula] . Thank you! Thank you! Thank you!" Although not everyone who used it benefited, we found the overall numbers to be extraordinarily high and wanted to verify exactly how high they were. And the results are now in, and we were not disappointed. Fenestra Research Labs has just completed Phase I human clinical trials (sponsored by Baseline Nutritionals®) on this formula. Researchers documented that significant changes to blood sugar balance, carbohydrate metabolism, and overall well-being were seen in all subjects in this six week study without any changes in diet. Glucometer blood draws showed an average 54.4 point improvement. Blood Sugar balance measured an average 52% improvement for blood sugar utilization and optimization as indicated by urine analysis using the Optimal Wellness Test. Carb metabolism showed an average 39% improvement as indicated by the Optimal Wellness Test. The lead researcher and president of Fenestra Research, Melonie Montgomery, offered that, "You can be very proud of these numbers, I have never heard of any natural product that could lower BS numbers more than 8-15% at the most." Understand, that the significance of these numbers not only lies in validation of the formula, it lies in the power it gives you to regain control of your blood sugar level or prevent it from becoming a problem in the first place -- or for that matter, reverse the aging process. In a perfect world, all food choices would be healthy, convenient, nature-based ways of fueling your body. That being said, the world isn't perfect, and even the best intentions and efforts to live a health conscious lifestyle are hindered because mass distribution food markets have traded nature-based foods for convenience and quick cash. And the world is suffering -- long time consumption of high sugar foods and foods that quickly turn into sugars is affecting just about everyone. Consider that in the United States, per capita sugar consumption now averages a mind-blowing 152 pounds per person per year. This is hardly surprising, though, when you consider that virtually every packaged food contains several kinds of sugar disguised in ingredient lists as sucrose, corn syrup, fructose, and even caramel color. As you may, or may not, know, all foods must be converted into glucose before they can be used as fuel. You have a safety mechanism to ensure that your glucose level remains relatively balanced. It works like this. If your blood glucose levels fall too low, then your brain triggers you to feel hungry, so you eat food that is turned into glucose. If your blood glucose levels rise too high, then your brain tells your pancreas to release insulin, which enters your bloodstream to clean up excess glucose. If you are constantly eating foods that create high levels of glucose, then your body reacts by producing too much insulin (insulin over-production). Over time your body stops using insulin effectively (insulin-insensitivity), leaving behind excess glucose in the bloodstream. (By the way this turns to fat!) Plus, your pancreas begins to overcompensate by working harder and releasing even more insulin. In other words, super-refined carb-foods are converted into glucose very quickly - too quickly for health. As a result, your blood-glucose shoots up (called a "sugar-spike"). This fools your body into releasing too much insulin. In turn, the extra insulin mops up too much glucose and your level falls so low that the brain makes you feel hungry again! It's easy to see that if you eat every time your brain triggers hunger, weight gain is inevitable -- an unhealthy and exhausting cycle that can lead not only to obesity but disease. Either, you exhaust your pancreas and you develop type 2 diabetes (previously called adult onset diabetes, obesity related diabetes, or non-insulin dependent diabetes mellitus), which is characterized by body tissue resistance to insulin action, though decreased secretion of insulin can also occur. Type 2 is by far the most common form, especially in developed countries. Or you don't develop diabetes but, instead, develop hyperinsulinism (abnormally high levels of insulin in the blood). This can cause health problems including hyperglycemia, hypoglycemia, and chronic obesity, as well as high blood pressure, high levels of triglycerides, low HDL (good) cholesterol, heart disease, and possibly some cancers. The bottom-line is that we need to balance our blood sugar levels and increase carbohydrate metabolism. And this is just what this formula does for you. Let's look at some more of the study results. Beginning Glucometer blood sugar readings were at least 45 points away from the average recommended range for normal healthy adults. Beginning blood sugar balance level was in the red zone meaning that it was at least 35% out of balance according to the Optimal Wellness Test. The Optimal Wellness Analyzer is an analytical system that uses cutting edge science to evaluate health at the cellular level. Objective testing procedures are the basis for this analysis, so there is no subjective input from the tester. A computer-based software program provides printouts with cellular imbalances brought to light. The Optimal Wellness Test runs a combination of 45+ tests run on non-fasting urine and non-fasting saliva. This study was a randomized, actively controlled clinical trial involving six weeks of supplementation. The product used exclusively was the sugar metabolic enhancement formula at the recommended dosage of 2 capsules, 10 minutes before each meal. Evaluation of blood sugar levels was performed at baseline, at the end of two weeks, at the end of four weeks, and at the end of six weeks. One of the purposes of the study was to identify any changes in usage protocol that would enhance the efficacy of the formula. After one week, 42% of the test subjects demonstrated less than expected results; so researchers backed up and looked for a significant difference -- and they found one. It turned out that the subjects who were not responding to the formula had a long history of insulin compromising their systems. The biochemistry of these subjects revealed potential deficits in organ functioning (i.e. a pancreas only operating at 10-15% or weak stomach acid) that reduced the subject's ability to effectively break down the capsules and utilize the formula. This information provided a key to better understanding how to use the formula. As I have mentioned in previous newsletters, for this formula, the timing of the capsule breakdown is very important. The capsule has to break down before it enters your intestines, or the special fibers in the formula will not block the receptor sites before the carbohydrates reach those sites in order to slow down their absorption. In other words, if the capsules don't break down in time, you will lose much of the benefit. It was agreed that the delivery method needed to be modified for those not responding. Two optional delivery methods were implemented in order to see if it was possible to offset slow capsule breakdown in those subjects not getting optimum results. One group removed the formulafrom its capsules and drank it down mixed in a little water so that no capsule breakdown was required. For those already responding well, the standard protocol of 2 capsules 5-10 minutes before eating was continued. Overall blood sugar levels as measured by the Glucometer dropped an average 54.4 points. Optimal Wellness Test Blood Sugar improvement averaged 52%. It was also noted that no subjects had side effects or allergic reactions. You have no doubt heard a lot about carbs in the news, but most people actually know very little about them. Of all the foods you eat, carbohydrates are the most easily converted into glucose -- your body's preferred source of energy, and your brain's essential source of energy. The controlling mechanisms for this energy exchange are insulin and a critical molecule called adenosine triphosphate (ATP). Your cells have insulin receptors strategically located so that insulin can easily bind to them, enabling glucose to enter and be used by your cells. Once inside your cells, glucose is burned to produce heat and ATP. ATP intelligently stores and releases energy as required by your cells. The carb metabolism numbers from the study that we looked at earlier represent a look at the ability of the ATP cycle to produce energy from the above carbohydrate mechanisms. Again, the Optimal Wellness Testing indicators for utilization and assimilation of carbohydrate metabolism indicated an overall positive Wellness improvement of 39%. The bottom line is that this study showed that this formulaoptimizes carbohydrate metabolism so you burn fuel more efficiently and offset stored fat. In fact, remember when I mentioned that the color zone indicators for carbohydrate metabolism at the start of the study were all in the red zone, meaning they were at least 33% out of Wellness range. At the end of the sixth week testing period all subjects had moved into the yellow and some even into the green zone of Wellness numbers. Researchers point out that these are very powerful indicators for measuring and evaluating the body's ability to burn more carbohydrates for energy instead of storing them, providing the person with more energy and less fat storage. With this in mind, consider that at week 6 of this study there was a surprising, but not entirely unexpected result -- weight loss. 21 subjects reported at least 10 pounds of weight loss during this study. Researchers also had several reports of chocolate craving being significantly reduced and the effects of chocolate being reduced. Managing blood sugar levels goes a long way toward diabetes prevention and the exhaustion your entire system experiences when on the roller coaster of high and low glycemic swings. The extreme stress of repeated sugar spikes exhausts and ages your body at a much faster than normal rate. Being able to balance glucose levels helps stop this damaging cycle. Interestingly enough, lowering plasma insulin levels also tends to lower body temperature and increase DHEA levels (both anti-aging markers), indicating that lowering the insulin response (which this formulais now proven to do) may be a prime factor in slowing down the aging process. Optimizing carbohydrate metabolism helps to offset aging in a way similar to a low calorie diet. Caloric Restriction is the only known dietary measure capable of extending maximum lifespan, as opposed to average lifespan. Put simply, when you can eliminate stress and damage related to food intake, you live longer. While this formula can benefit virtually everyone, achieving blood sugar control can be a life-altering phenomenon for the millions and millions of diabetics around the world -- and let's not forget the millions more who are hypoglycemic and/or borderline diabetic. According to the Center for Disease Control's 2005 National Diabetes Fact Sheet, studies in the United States and abroad have found that improved glycemic control benefits people with either type 1 or type 2 diabetes. In general, every percentage point drop in A1c blood levels reduces the risk of microvascular complications (eye, kidney, and nerve diseases) by 40%. Diabetes is the leading cause of new cases of blindness among adults aged 20 to 74 years. Diabetes is the leading cause of kidney failure, accounting for 44% of new cases in 2002. Severe forms of diabetic nerve disease are a major contributing cause of lower-extremity amputations, in fact more than 60% of nontraumatic lower-limb amputations occur in people with diabetes. Don't get me wrong; I am in no way saying that this formula is a cure for diabetes -- merely that Phase I clinical results indicate that the precise combination of natural ingredients found in it appear worthy of closer examination. This study was designed to determine the effectiveness of the formula in enhancing sugar metabolism without making any changes in diet or lifestyle or incorporating any other elements of the Baseline of Health® program. With that said, the results were nevertheless highly encouraging and potentially life changing. The 52% average improvement in blood sugar utilization and optimization numbers is comparable to that experienced when using the prescription drug, metformin -- approximately double that seen with other "all natural" alternatives. According to Fenestra Research Labs, this study on the formulahas provided solid proof that using this all natural formula can help individuals gain control over any blood sugar problems they may be experiencing, or prevent them from happening in the first place. 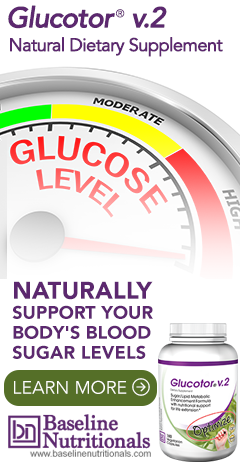 Drop dangerous blood sugar levels closer to the normal range. Help eliminate excessive glycemic swings in those who are hypoglycemic. Support your body's ability to burn more carbohydrates for energy instead of storing them -- providing you with more energy and less fat storage. Prevent wear and tear on your body and potentially maximize life span in those who are healthy. I am also trying to find out where to get Glucotor 2 mentioned in the newsletter for blood sugar control. It is not listed on this link. Can anyone help? I am really excited about the "Barron's Formula". I have had diabete's sence 1997, I have not taken any medications. But I quit smoking about 1 1/2 years ago and ever sence, I had a real problem getting my blood sugar to stay down. I had to go to the hospital about 2 weeks ago, I have been going to TCM doctor and did not realize the tea I was taking had licorice in it so I ended up with high blood pressure and high blood sugar------so I am taking Amaryl 5mg in the morning. The hospital did all kinds of test and everything was great, the doctor's couldn't believe I had been a diabetic for this long with out having "ANY" problems. But I have been taking care of myself with Herbs, vitamins and minerals. I was just reading up on your Barron's Formula, I feel maybe this could help me with my problems. I also just had an eye examine and my doctor of 20 years said there is no sign's of diabtes in my eye's. So where can I buy this Barron Formula and is this the same as the GV2 formular also. I want to get off of this medication as fast as I can, but I am not stupid, I know I need to control my blood sugar with something, I need to things a Program that shows me what type of food to eat and a natural formula that will help control my blood sugar. Coul someone please help me, Please the doctor in the hospital told me and my husband: I want make it clear we are not trying to cure the problem we are "ONLY" treating the systoms!!!!!!!!!!!!!!! There you go, medications is all the doctor's will talk to you about, can anyone help me? Have you looked into a herb called benfotiamine for high blood sugar? I have recently read info about a medicinal mushroom called Agaricus blazei. This mushroom supposedly supports adiponectin levels - adiponectin being a substance that our bodies naturally makes that helps control blood sugar. This mushroom is being touted as the 'holy grail' of blood sugar balancers. I had never heard of this mushroom OR of adiponectin before seeing an advertisement for a supplement that contains this product. Do you know about the research on this mushroom and will you eventually be adding this to your sugar control product? For the seven ingredients in the sugar metabolic enhancement formula, can you take the ingredients out of the capsules without any toxic side effects, put in water and drink it? System is slow and has problems breaking Down a lot of pills. Yes, some people have a problem digesting the capsules quickly enough. Try taking the Glucotor® v.2 out of the capsules and having it with a little applesauce or mixing it in a small glass of water. I want buy the Glucotor V.2 but apparently you don't ship to my country SOUTH AFRICA. Is there any place in my country where I can find your product(s).